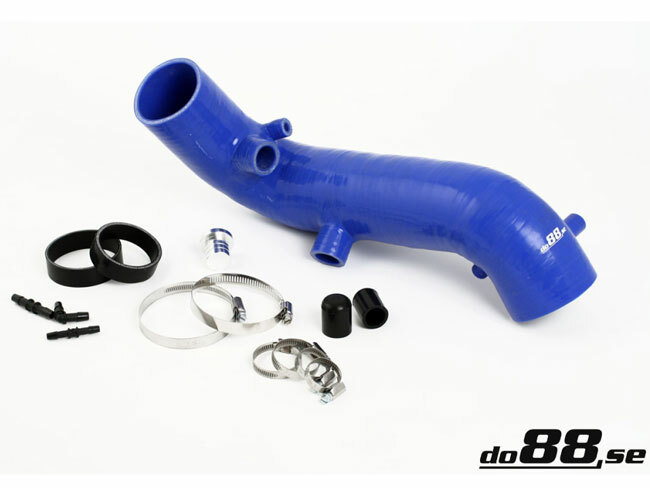 3" Turbo inlet hose for Volvo 850/SVC70 Turbo. Hose inside diameter is 76mm (3"), much larger than original for increased airflow. 76mm connection for the MAF, but mounting accessories to mount on original 70mm MA are also included in this kit. Developed for 70mm connection on turbo, but mounting accessories to mount on original 60mm turbo connection are included. Socket for BOV recirculation (25mm) is located on the hose underside. This is for those who do not use the original by-pass valve in the turbocharger. Plug is included if this is not being used. Note that the hose is designed for 70mm turbo connection. This means that it is very little space to install this hose for cars with OEM turbo with 60mm connection. The hose is very tight against the wastegate bracket. A small pice of the hose needs to be cut out to make clearence for the Wastegate screw boss, otherwise the hose will not fit good. But it is possible to mount (not for the amateur)! If installing to a larger MAF housing than the standard part, the ecu must be reprogrammed and or fuel injectors upgraded to support this hose. The hose is reinforced with steel wire so it won’t collapse during high vacuum.